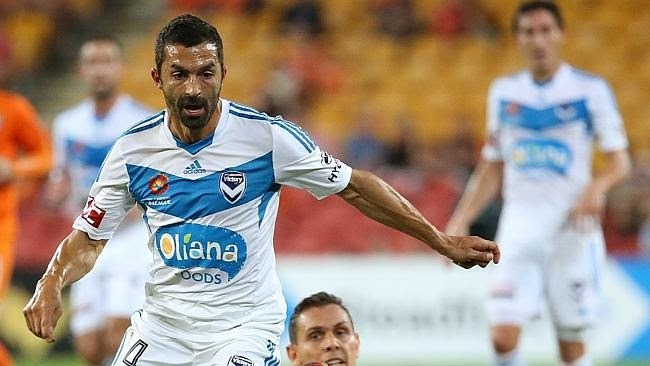 Round 27, the final round of the Hyundai A-League season, where so much is still up for grabs. While the six teams taking part in the Finals Series have been settled, there are still important play-off placings up for grabs as the tenth home-and-away season of the Hyundai A-League reaches its climactic final round. With a three point advantage at the top, a final round match at home, and a seven goal difference advantage over the only other possible Premiers’ Plate contender (Sydney FC), Melbourne Victory look set to secure its third Premiers’ Plate when it hosts Central Coast Mariners at AAMI Park on Sunday. A slip-up by Muscat’s men over Newcastle in Round 25 was quickly forgotten with two impressive wins over Brisbane Roar FC in the space of four days, providing a spurt of form at just the right time. A 2014/15 Premiers’ Plate would be the Victory’s third, which would be a new record for the Hyundai A-League, and puts Melbourne Victory right up there with the all-time great clubs of Australian national league football. Only Sydney City (six), South Melbourne (five), Marconi (four) and Melbourne Knights (four) won more Premiers' Plates in the 28-year history of the NSL. Sunday also sees the most crucial confrontation of the 2014/15 Hyundai A-League season when Wellington Phoenix – third leading into the final round – takes on second-placed Sydney FC. Both Wellington and Sydney are coming off spectacular come-from-behind wins in the penultimate round to set up a decisive final round encounter at Westpac Stadium. A win to Wellington at home would see the Phoenix secure the all-important second position on the ladder, earning the New Zealanders a week’s rest, home ground semi-final advantage and an opportunity to host the Grand Final. Sydney meanwhile just need a draw to finish in the top two, while an unlikely thrashing of the Phoenix provides the Sky Blues with an improbable sniff of first place on the final ladder. While home ground advantage should provide Wellington the edge, Sydney FC will think differently having established the remarkable feat of not losing any of its away matches leading into the final round. Only on one other occasion has a team gone through an A-League home-and-away season undefeated away from home, that being Sydney FC themselves in 2007/08; while we need to go all the way back to the first season of the NSL in 1977 to find Sydney City the only other time a team won or drew all of its away matches in a national league season. The one other last-round match featuring two finals series teams takes place at Coopers Stadium on Saturday, with Adelaide United and Melbourne City squaring up. Both clubs have slipped a little in recent weeks, and a Round 27 loss for either club would see that team entering the finals campaign with an unwanted three-match winless streak. And with Adelaide United and Melbourne City FC a distinct possibility to meet again in the first week of the finals, there would be an extra psychological edge for the winner in their final round match. While neither side can make the finals this season, it’s no cop-out to say Western Sydney Wanderers and Perth Glory are battling for major pride in their confrontation at Parramatta Stadium on Saturday. Current Asian Champions and Australian Grand Finalists for the past two seasons, the Wanderers run the risk of finishing at the bottom of the pack if they don’t win at home.